This is not just any t-shirt. This athletic cut, performance wear, T-shirt is a be cool, stay cool, moisture wicking, sun blocking polyester shirt, that is imprinted with the Hoffner Sheepdog Warrior and the embodiment of the Hoffner Creed and Attitude front & back! In this world there are three types of animals: the sheep, the wolf who eats the sheep, and the Sheepdog who protects the sheep and destroys the wolf. 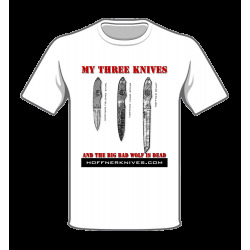 This awesome T-Shirt tells the story of "My Three Glocks" - Papa, Mama, & Baby. When the wolf is at the door, don't let him blow the house down...Blow him away! 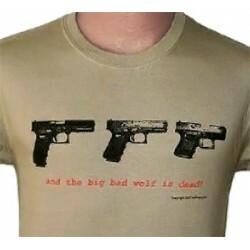 The T-Shirt reads "and the big bad wolf is dead". SoSu Bowtie on back collar. 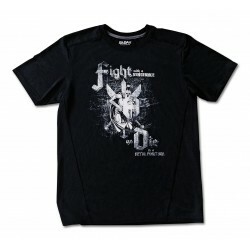 Hoffners popular "Sights-on, Slack-up" logo on the front and a "One Warrior All Weapons" (one of Brian's famous training philosophies) print on the back. Wear it with an attitude!